Crunchy, delectable, sweet. 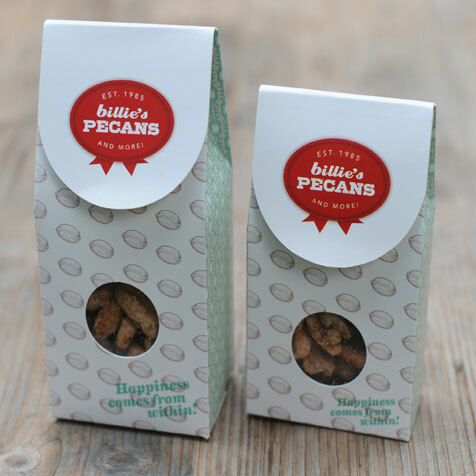 Billie’s Pecans and More will send your taste buds into overdrive, but it’s Hemline’s marketing that elevates Billie’s natural goodness to sheer greatness. Like any good Southern marketer worth her salt, we set about telling Billie’s story, honing her voice and then promptly spreading it through her new brand platform, a product package redesign to a new website complete with a product ordering feature (in addition to some darn good storytelling! ), eblasts and social media postings, all while continually pitching her story and delicious product offering throughout social media outlets. We’re receiving rave reviews and word about Billie’s is spreading like Mississippi kudzu. “So glad to find this company,” wrote one new fan. “I'm always looking for something unique to send as gifts. Thanks so much for sharing!” It’s our pleasure, indeed.